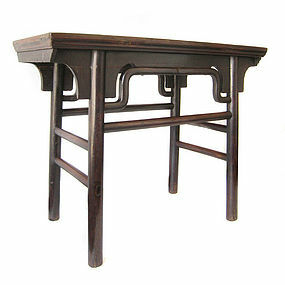 Chinese antique painting table, all solid jumu (elm) wood, very strong traditional construction, original dark brown worn lacquer finish, beautiful grain especially on surface of table top, 19th century. Size: 32" high x 40 1/2" wide x 19 1/2" deep. 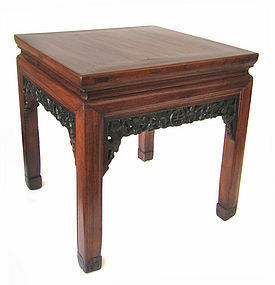 Small Chinese square table, beautiful deep golden brown finish, carved aprons with bats and flowers, great side table or stool. 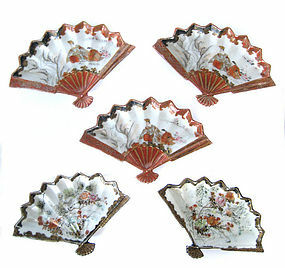 Size: 19" high x 19" wide x 19" wide. 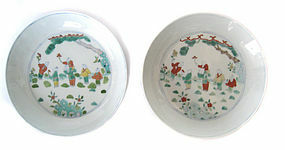 Charming set of 5 small porcelain Kutani ware plates, two with black and gold rims and scenes of birds and flowers, three with black, gold and orange rims have scenes of noble man and attendant sitting by waterfall, mark of backs, circa 1930's. Size: 5" high x 3 1/4" wide. 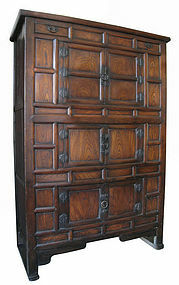 Large Korean antique kitchen cabinet, deep brown finish, elm wood panels on front with beautiful grain, iron hardware, 3 large compartments with hinged doors, 2 small drawers at top, 19th century. 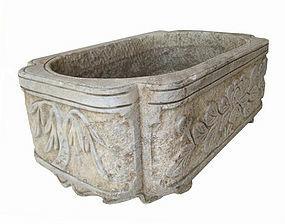 Size: 67 3/4" high x 46 1/4" wide x 20 1/2" deep. 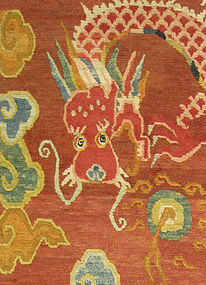 Chinese altar table, light honey colored finish, carved with scrolling dragons on apron, flanged top, legs have slight A-line, comes with glass for top, table is 19th century. Size: 37 1/2" high (40 3/4" high to top of flange) x 84" long x 15" deep. 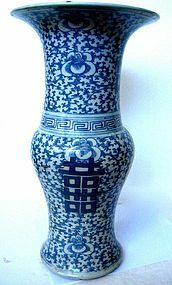 Chinese antique blue and white flared lip vase with floral design overall, on lower neck key design encircles body, large dark blue double happiness mark decorates body, four character mark on bottom, 19th century, size: 15.5"H 8.5" Diameter, age chips on edge of lip. 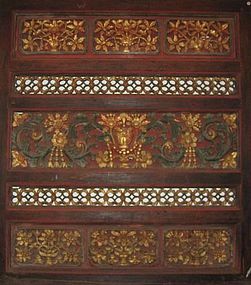 Chinese antique deeply carved panel with floral motif on hardwood with gilt, floral sprays wonderfully depicted in red and green pigments, over 100 years of age, size: 52.5"W 59.5"H 2"D.
Pair of Chinese small porcelain Doucai plates, underglaze blue with overglaze enamal of scenes of children playing, each piece differs from the other, Ming inscription but I believe date from 19th century. Size 6 inches on Diameter.